Based in Michigan, Donte's Playground is a blog by Donte M McNeal. His posts range from nonsensical ramblings about anime, in-depth reviews of books and television/film, to random spurts of philosophical babble. From the beginning, you get a sense of how good Collins can describe a setting. I mean, "Water bled from a bruised sky, soaking the streets as gusts of wind shoved him with cold hands." That's a great scene-setting sentence. And this book is full of great lines like that; Collins is a great, descriptive writer. The world created in this book is an amazingly engrossing one, full of rich scenery and landscapes. If only it were real, I'd like to see it. One of our mc, Evan is a haunted individual, and yet he doesn't allow what haunts him to keep him from trying to help others. You get the sense that he's a good kid, and has a relatable personality, something that's integral to a good story (most of the time at least). Our other mc, Brooke is in the same boat. Having suffered a tragedy, she is secluded at home, and is haunted by the dark memories of her brother. Another thing these kids have in common, is that they're special. And not the, "everyone is special" sort of way; they're special in that they can do magic! These two are pulled from their lives and thrown into another, fantastical world where things that were once impossible to them are commonplace. The contrasting ways they react to their new situations is a sight. One is willing to give up a life where things are going less than ideally and has used sorcery before, while the other is wondering whether they even belong in the magical world, and doubt whether sorcery even exists in the first place, initially at least. I adore characters who are flawed and question the things that are expected of them, and both Evan and Brooke seem like that type. Speaking of characters, the book is front loaded with them. It's almost overwhelming how many names/characters are introduced in the first handful of chapters. Though, I suppose that's par for the course in a fantasy novel. Still, it was hard to determine which character's names I should try to remember and in turn, form attachments to. This abates however, the further into the story you go. A clearer picture begins to take shape, and you learn who the characters are that are worth remembering in the cornucopia of characters presented. On a (maybe) minor spoiler note, I'm glad the trope of having the two main characters end up being love interests just for the sake of it was skirted. Both Brooke and Evan have romantic interests, that aren't each other and that was refreshing in a YA novel, I must say. Though I think platonic friendships between opposite sexes is a refreshing, underutilized concept in and of itself. The story is an engaging one, where the pacing is steady. There are a handful of moments where there are breaks in the story but the world that is being explored is definitely worth the breaks in story. The world is just as interesting the story, surprisingly. All in all, the characters are well developed and entertaining, and I cared for them and felt for them when they went through their respective journeys/arcs. I can't wait to spend more time with these characters, especially given the revelations throughout the book. I can't recommend this book enough! A gripping story, an engrossing world and colorful characters; what more could you ask for? To say I was eagerly awaiting the sequel would be an understatement. I was enraptured by Collin's fist book in the series when I first read it, even with the info dumps throughout, what, with its captivating and immersive world, fleshed out characters and engaging storyline. So you can imagine my delight when I saw that the sequel had been released. Ok, that's enough gushing; how's about I continue my review? Moonlight War picks up where "A Darker Shade" left off, with the Fortress recovering from the demon attack that occurred in the prior book's climax. You see the aftermath of the carnage and chaos the demons are capable of, and if you didn't think these characters should be scared of the hellish creatures, that attack solidified just how vicious and formidable demons can be. With the attack over and Vanderain back, things are looking up for those at the fortress...well not exactly. Evan is blamed by many of the Realmers for the demon attack, Brooke is given the cold shoulder by the haunted and revenge-driven elfpire (elf & vampire), Arantay, and there are new enemies lurking and conspiring in the shadows, looking to get their hands on the demon spawns, Evan and Brooke along with the powerful magic dwelling within them. I was once again floored by how immense and detailed this world is, whether it's Veneseron or one of the countless realms that make up this "Realmers" universe. Collins does a great job using imagery to help the reader picture the world he's created, even if some of the descriptions slow the pace of the story at times. With that said, this continues to be one of the better parts of the story. Though, the introduction of new characters (which was a bit overwhelming at the amount of new faces) is nothing to scoff at. In Moonlight War, we meet a few new characters that bring with them dark and disturbing pasts and current predicaments. From drug-induced experiments, to insane Dark Venators, one of which I enjoy immensely (I'm talking about Saline; what can I say, I seem to love sadistic female villains), to other demon spawns; Collins does a great job bringing these new characters into the fold, while keeping our core characters at the forefront of the story. There are a few typos, grammatical and punctuation errors peppered throughout, but nothing that detracts from one's enjoyment of the book. Collins delivers with great action sequences, surprisingly normal human character relationships and interactions in a world overflowing with magic, and the stakes are higher than ever before for our protagonists, whether they're out in the realms somewhere or within the relative safety of Veneseron. You never know how things will turn out for Brooke, Evan and their friends, and that makes for a great read. The last few chapters of this book makes that perfectly clear, but that's all I'll say on that note. Welp, hope you all enjoyed this recommendation/review! I'll probably be back later in the week with a horror anime review...but don't hold me to that. Anyway, till next tune, stay golden ponyboy. Welcome one and all, I hope you're enjoying your time in my playground. If not, then I hope that changes as you spend more time rummaging through the rumblings of yours truly. That said here's what I think you'll enjoy most! Oct 7 B. C. Burgess' "Mystic Side Stories"
Jul 7 The Mystic Series: An Epic Romance! Sign up with your email address to receive a free copy of my book, "The Family," and keep up with news and updates about my future projects, giveaways, etc. Your privacy is respected. No information will be shared, nor will you be spammed, because who likes spam? Thank you for offering your soul . . . I mean, email address. Hope you enjoy staying in the loop! 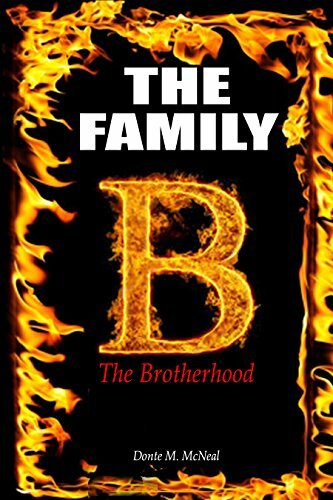 Your free copy of The Family will be on the way shortly.